Another attempt at the boyfriend jean trend. I think this is the closest I've come to pulling it off. It took me a while to figure out where I was going wrong. I finally determined that my jeans weren't baggy enough. I'm not a big fan of baggy jeans. With my figure, baggy just doesn't do it. They usually make me look heavier. The other day I found these jeans in the back corner of my closet. You know that corner where all the missing socks go to multiply! Yep, that's the place. I decided to give this look one more try. I pared them with a denim shirt, fur vest and fleece booties. The look went well with my Saturday activities. We went out to lunch and then drove on to the cabin. I'm not sure if I'll wear it again. But it was fun for the day. Hope everybody has a good week and keep those smiles styling! Linking up with Patti @ for Not Dead Yet Style for her visible Monday link up. Pop on over and show us what makes you feel visible. You know, you may be onto something here. Sometimes, baggy is flattering! I've just never quite been able to figure out what makes some versions of baggy flattering while others are unflattering. It's a puzzle, isn't it? But you look cute in those! Happy Visible Monday. Normally I don't like baggy jeans... but You wore yours so well that it looks so classy. I like this casual mix with a touch of classy elegance look. So you! I think you worked these jeans just right, Tammy - I love the booties and the fur vest with them. Thanks so much for linking up with Visible Monday, you look great! You look great in that outfit!!! Baggy jeans are not for me--I'm baggy enough on my own plus short but you really can carry off the look!! Tammy--It works! I'm the same way about baggy jeans and yet, there ARE times I actually wear a pair (say when we are raking leaves at the lake). I've been studying this look a lot lately...as I've noticed that many of my younger colleagues wear this to teach in on an almost daily basis. By contrast, I'm waaaay too dressed up. i think you did an awesome job at the boyfriend jean look. it's a tough one to pull off. love the denim on denim and the vest looks great! Thanks so much for showing off your style on Momtrends Monday Mingle. My husband hates the boyfriend look, but I think it is so cute. I like. It kind of has a western look, which I'm very fond of. Tammy, you look great in this outfit. I think you are way too critical of yourself. I haven't seen anything you don't look good in. The fur vest is the perfect topper for this outfit. And I love your hair. It always looks so perfect! Oh ya this is such a great outfit! 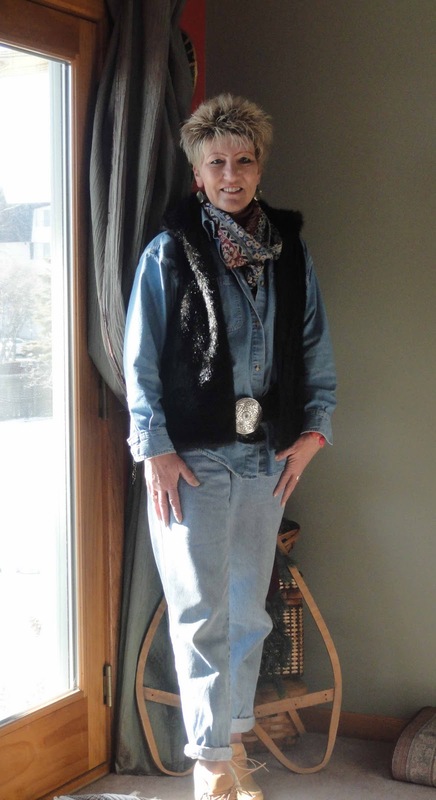 I love the denim on denim and woohoo for fur vests- they'r so effortlessly chic! I'm jealous of your cabin-I hope to one day have a quiet place to escape to on the weekends! Hey Tammy! Yea, baggy jeans don't work for me either - actually, jeans in general are tough for me but I think these look SO cute on you! I think the little cuff at the bottom gives them a tapered look and ads a little feminine touch. Perfect "cabin wear"! I think you nailed the baggy jean look! Its key to role them up too--and wear cute heels like you did. Perfection!